I am arriving belatedly but with an excuse. That would be the massive ice storm that descended upon New England and left us huddling for warmth in front of our fireplace. It was a humbling experience because in the span of a few hours, despite all our modern conveniences and scientific wherewithal over a million people were left without power in sub-freezing temperatures and hurled into survivor mode. We are now back to normal, thankfully, and I am able to respond, as best I can, to your intriguing post. Trying to answer some of the questions that you pose is a daunting task, one which I feel I am ill-equipped to tackle adequately to your satisfaction. I am after all a guy with questions of my own; your curiosity about the world around you surpasses my own by just a bit. I must say first that I am not a “follower” of Elder Paisios, or any of the other Fathers, Mothers, Saints or Elders of the Church. I am a follower of Christ, the Son of God. That said, I believe that within the body of His Church, there are those that offer us a living link to Him. Through their words and example we glimpse a greater understanding of Christ’s message. They are easily identifiable by the example of their lives. They are not the television evangelists in their Armani suits who stand before vast crowds or the exotic gurus entertaining the itinerant rock star with their wisdom. I don’t profess to be in their league nor do I imagine ever getting close. I do aspire to learn from them. I do aspire, like you, to be more Christlike. These “heroes and heroines” of our Church, live, breath and exemplify what Christ taught us and their counsels are well worth listening to. Keep in mind that their lives should not be held up to our own worldly values, because they are focused on a heavenly kingdom far removed from our own little world. Their words are for all of us, Christian and non-Christian alike, regardless of our origins, station in life or past history. All we need to do is listen. Since I am barely hanging on the “ladder of ascent” (you may recall the icon) I will give you benefit of the Elder’s own words before I throw in my two cents worth in. I think you are right that we often see things through the prism of our own experiences. Freud would be pleased with your use of his theory, steeped in Western rationalism, which tries to give us some understandable semblance of the forces at work within us. Perhaps we can both agree that his theory partially explains the inner workings of personality but completely ignores the human soul (if we believe one exists). Only more questions arise: what factors cause one element to take precedence over the other? How does it mesh with other theories of personality? Why do people do things that are “out of character” (I am reminded of the Police Inspector in Victor Hugo’s Les Miserables). Lancing a boil or even treating it with an antibiotic does not always result in a cure. Allowing the pus to drain out simply relieves the pressure for awhile. It is temporary. Antibiotics in the face of bacterial resistance also provide little, if any relief. Sometimes the infection that a boil represents, spreads and can make us sick, maybe even kill us. Doctors can fail us. Far from absolving humanity of its need to solve worldly problems I am merely advocating that we concede that we humans may not have all the answers. We need God’s help. Hope is a good thing, we just need to avoid putting all our eggs in our own ability to solve all our problems, all by ourselves. BTW, Great photo. If only we could love and be as innocent as young children. Thank you for taking the time to post such a long reply to my post. You are quite right – “follower” was the wrong word to use, and I apologise, though I don’t think I intended it to imply you when I used it. 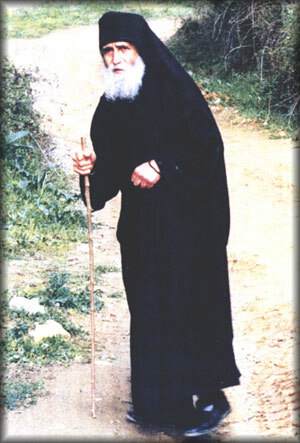 However, your enthusiasm for the words of Elder Piasios, coupled with that of your commenters and the anonymous provider of the prayer, is something which is somewhat baffling for those of us who have grown up in a tradition where few living or recently dead humans are afforded the stature that is afforded Orthodox Elders. I find it very difficult, if not impossible, to think of equivalents – Mother Teresa, Desmond Tutu, perhaps, but not quite. It is a very significant difference, one which had not struck me before, and one which, I think, depends on the monastic tradition which underpins it. Deprived of that tradition, there is perhaps an arrogance in the Anglican church which leads those who choose to worship there to believe that the sermons of our ministers, even our Archbishop, may inform us, help us, but do not have the authority that Elder Piasos seems to command. You include in your post a picture of him looking somewhat bemused as people crowd round him, hanging on to him, as if touching him will bring them something. Now I am totally lost for any parallel within the Anglican church, though my Catholic friends may feel more at home. Discernment is everything, and here I hope we might agree. Because everyone needs discernment to eschew false prophets, to sieve out the wheat from the chaff (Cue your quote about wolves inside and outside the fold …). I don’t have all the answers. Perhaps if I prayed more, and read more of what Elder Paisios had to say, I would be further along the road. The huge trouble with any attempt to be Christ-like is that one is, almost by definition, always failing. Which makes one feel bad. It’s difficult to live like that. I cannot remember if I told you that the icon you mention (Ladders of Ascent) is the most arresting icon I have ever seen and it sounds as if you were struck by it too. It gives me the shivers – and I’ve seen it twice now. I’ll post it above for others to see. about a horrible spikey creature that haunted my childhood, and I know that those horrrible spikey demons on the icon remind me of that. By quite why Raggety should have been so frightening is a different question. He was definitely evil. Perhaps the very skilled icon painter was very successful in portraying evil in those demons. Brrr. I like the quotes from Elder Paisios. There is a world of difference between knowledge and wisdom, though we are often intimidated by knowledge and overlook wisdom.